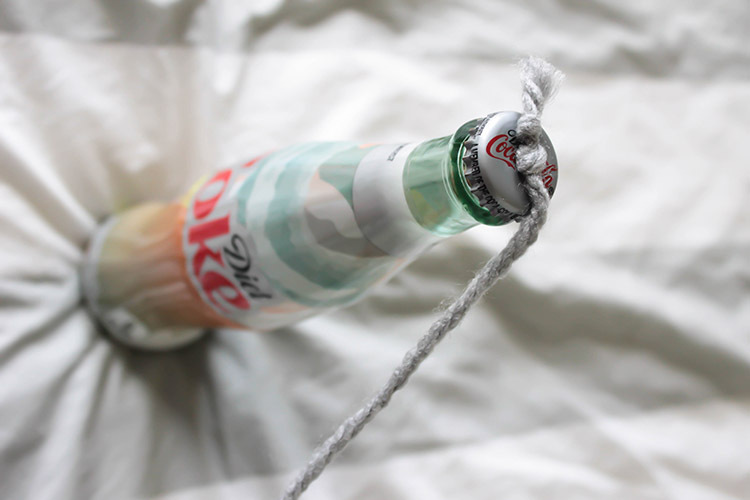 Quick And Easy DIY Bottle Chandelier! 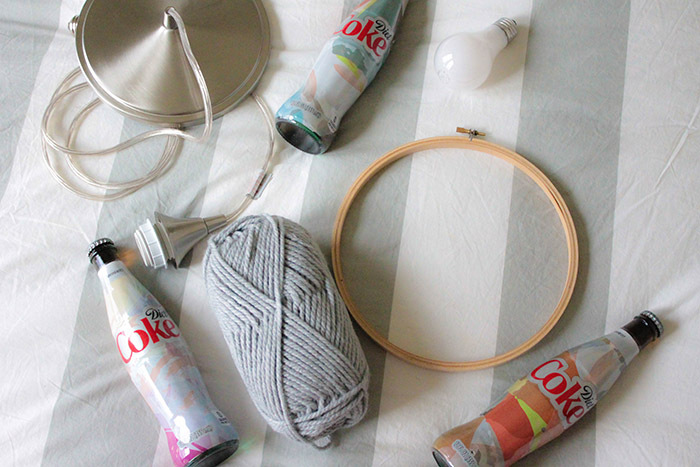 Lovelies, we have a fun DIY bottle chandelier project for you today and it uses the new super lovely Diet Coke “It’s Mine” bottles! Have you seen them in stores yet? They are fabulous! Haven’t heard of these bottle yet? We have the inside scoop for you! 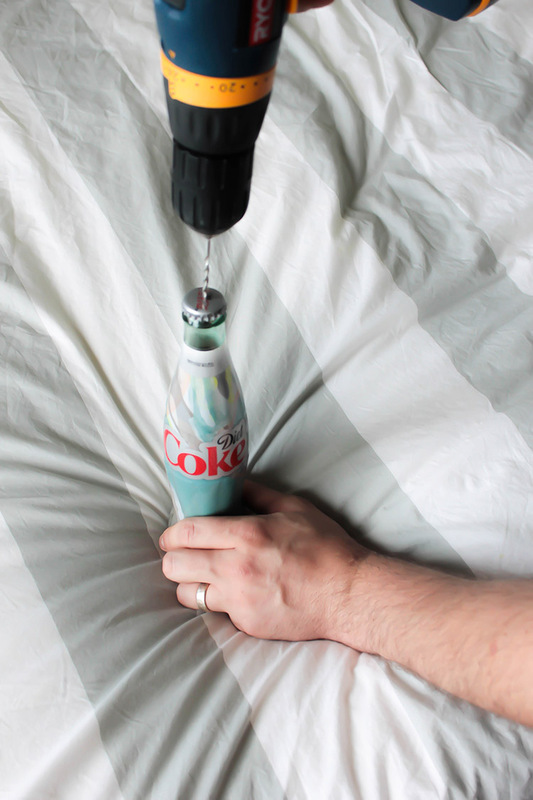 Every Diet Coke bottle is completely unique which means you can have a bottle that no one else in the world owns. How cool is that?! 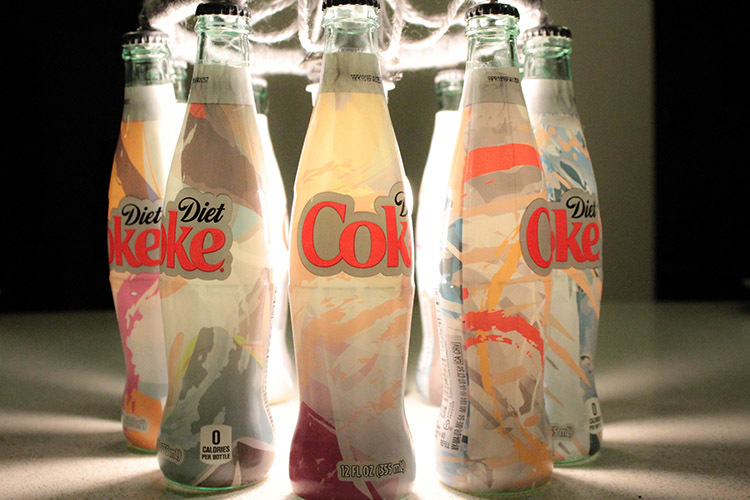 No two bottles are the same and each one has it’s own fabulous design on it. 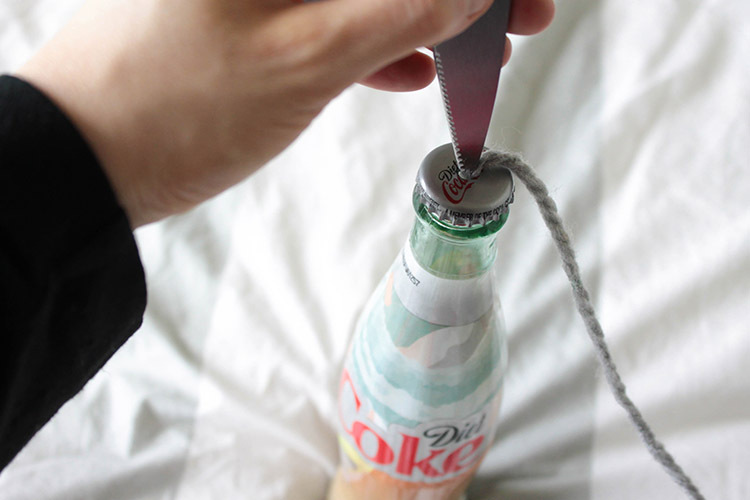 There are cans and even mini aluminum bottles with these designs but our favorite is the glass bottles. 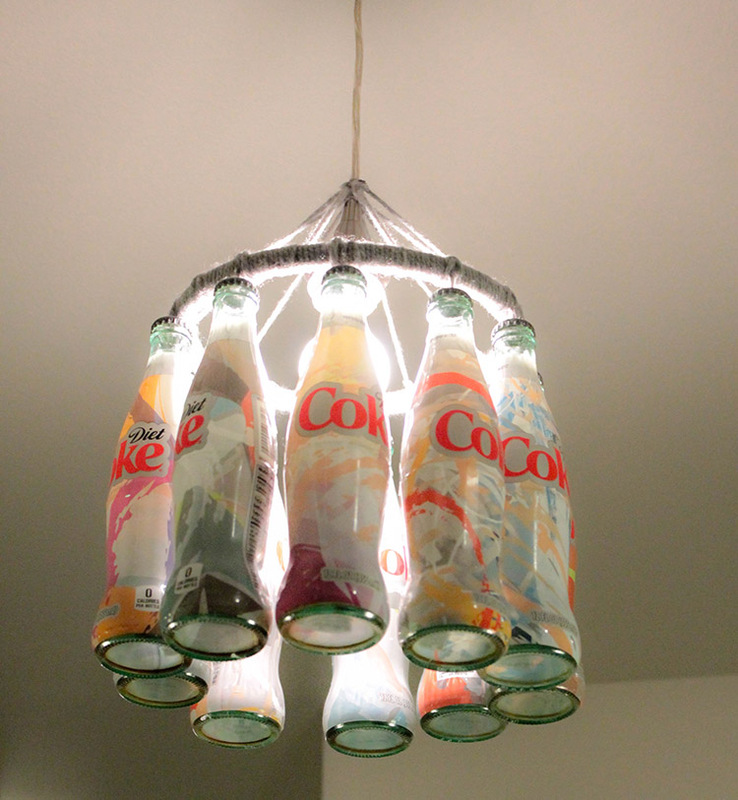 It is like taking the amazing retro bottle that we all love and bringing it into a modern era with these amazing designs. 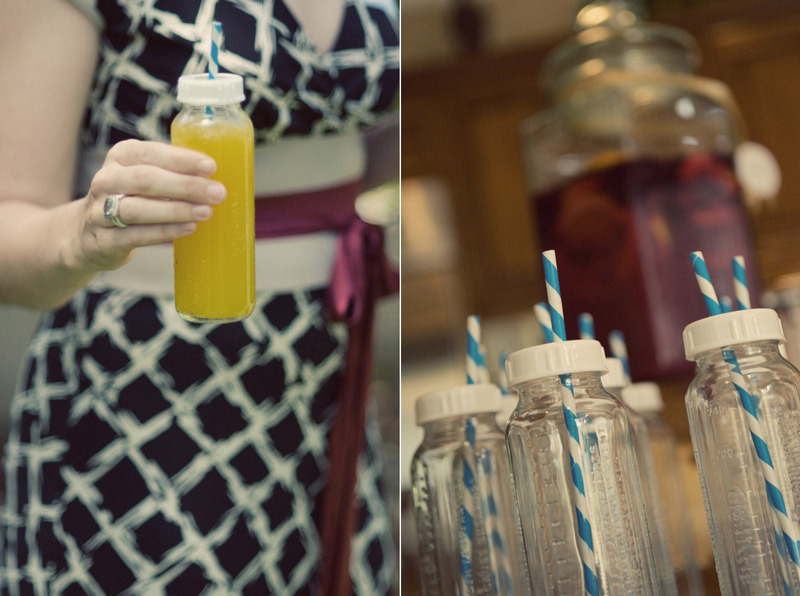 Now everyone can drink fashionably with millions of looks but same great taste! We picked up ours at Albertsons! 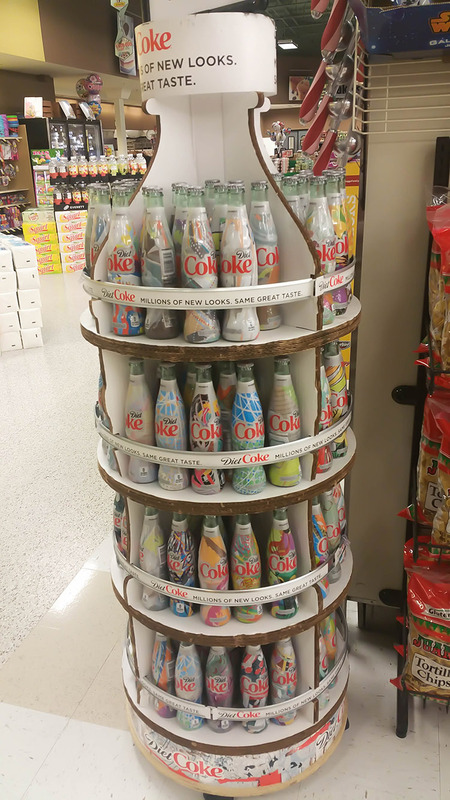 They have an amazing display full of all different “It’s Mine” bottles. Even the display is a bottle so you can’t miss it. We found ours right at the end of the soda aisle, which happens to be right next to the chips. Everyone knows there isn’t a better combo than soda and chips! Albertsons is also having an amazing sweepstakes with Diet Coke right now that you don’t want to miss. 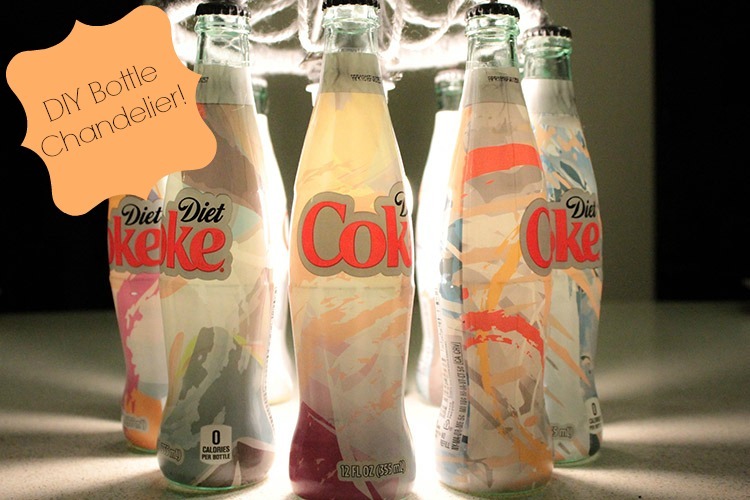 Just snap a selfie with your one of a kind Diet Coke bottle for your chance to win a trip to Primetime TV’s Biggest Award Show! 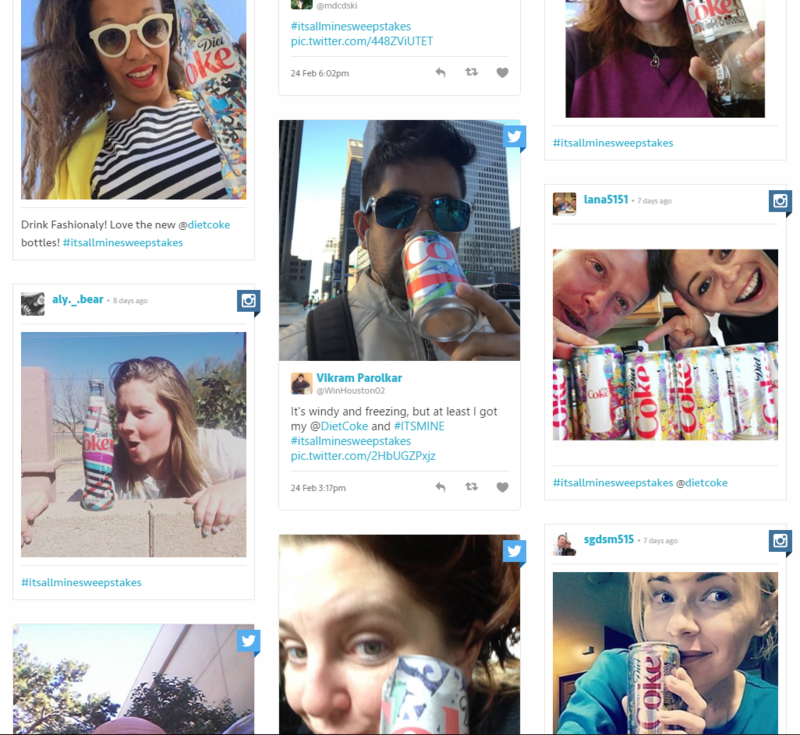 -Snap a selfie with your favorite Diet Coke It’s Mine branded bottle/can on Twitter OR Instagram with the hashtag #ItsAllMineSweepstakes for a chance to win. Twitter: Your account settings must be set to “unprotected” and/or “public” in order for your Tweets to be viewable to enter into the sweepstakes. Instagram: In order for your entry to be valid, your Instagram profile must be public. -You could win 1 of 10 VIP prize packages for 2 to Los Angeles to see Primetime TV’s Biggest Awards show in September! Packages include hotel, travel gift card, pre-party reception, exclusive gift bag and tickets to the awards show. What a deal! -You may register between February 3rd, 2016 and April 26th, 2016. Winners will be selected around April 27, 2016. For more information on the sweepstakes click here. Look how fun you can get with these photos! Once your entry is submitted, your entry picture will be added to this site. If your photo does not appear within 24 hours, your entry did not submit appropriately so if that does happen be sure to check for the appropriate hashtag and whether your Twitter/Instagram was made public prior to your submission. 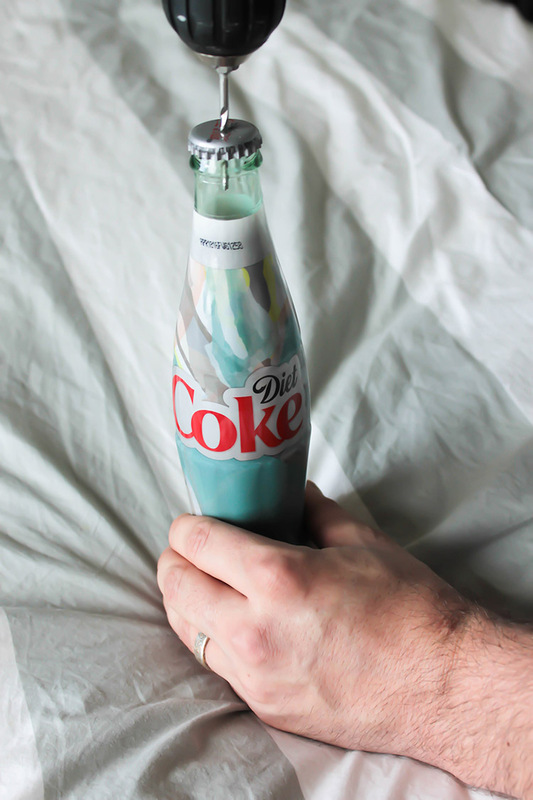 We were so inspired by the different designs on the “It’s Mine” bottles and our favorite pattern that we spotted are the ones that have watercolor brush strokes on them. 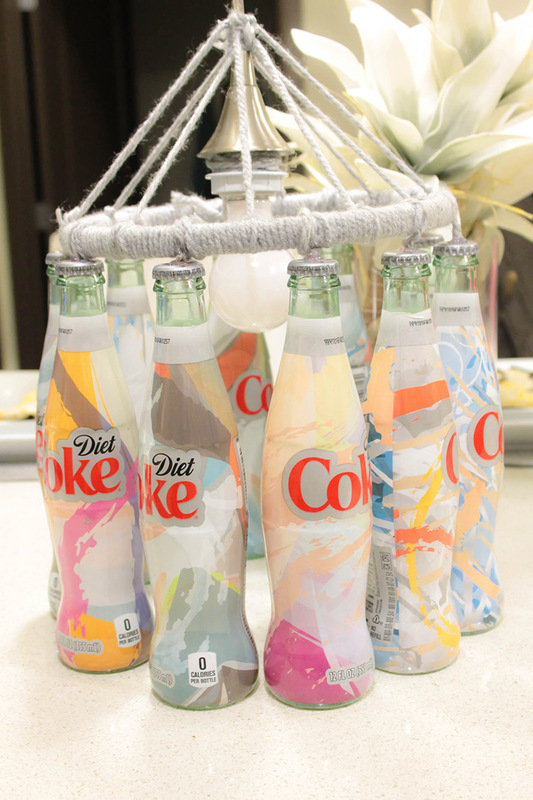 Watercolor adds such a lovely look and feel to designs and the ones on the new Diet Coke bottles have such amazing colors on top of that like peaches and greys to fushias and navy. Even though these bottles are all different, their soft color pallets and brush stroke design brought them all together. We thought this pattern would pop even more if it had a light behind it and if you made it into a chandelier, all those colors would cast on the wall creating this amazing look that is great for parties or even home decor. Just wait until you see it, it’s pretty awe-inspiring! 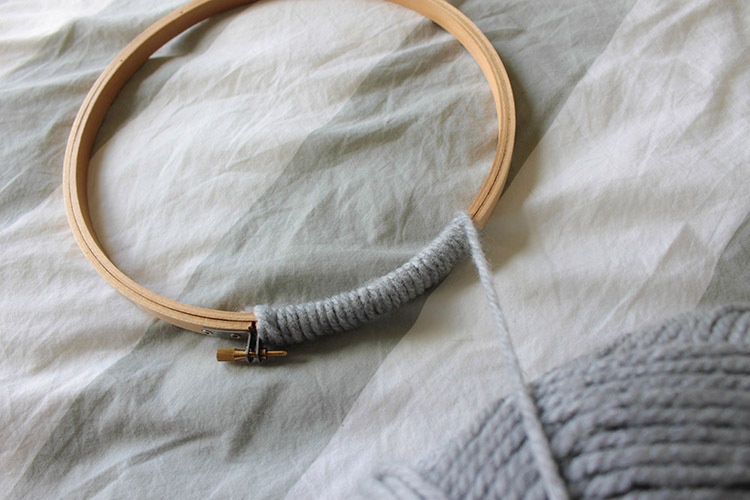 -Yarn -we chose grey to tie in the classic Diet Coke Color into the look. 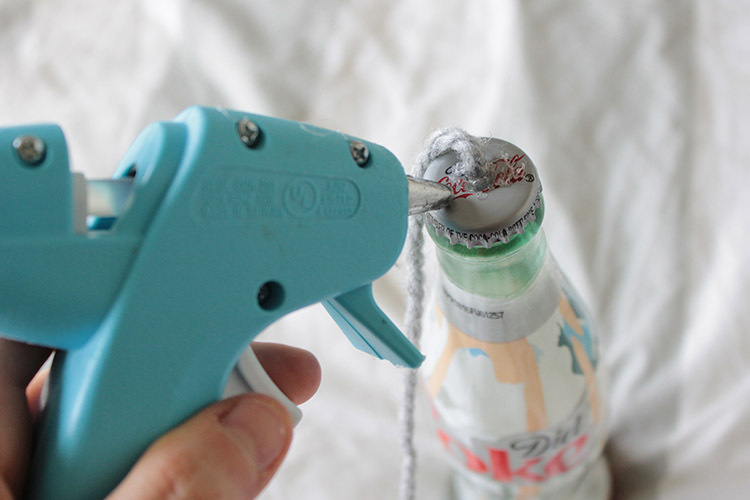 Easy Step By Step Tutorial- Less Than 10 Steps!